I am relieved because I have just finished our family photography book for last year. What a delay! I actually like the process of putting these books together very much and the final books are appreciated by family close and far, but it is very engrossing. Now that it is done I can spend again more time with my "other" photographs and with writing. Here is the third, and at least for a while the last, photograph of the buildings on Hagenholzstrasse in Zurich-Oerlikon, which I have already shown twice from different angles (here and HERE). This point of view and composition is quite different from the two others. 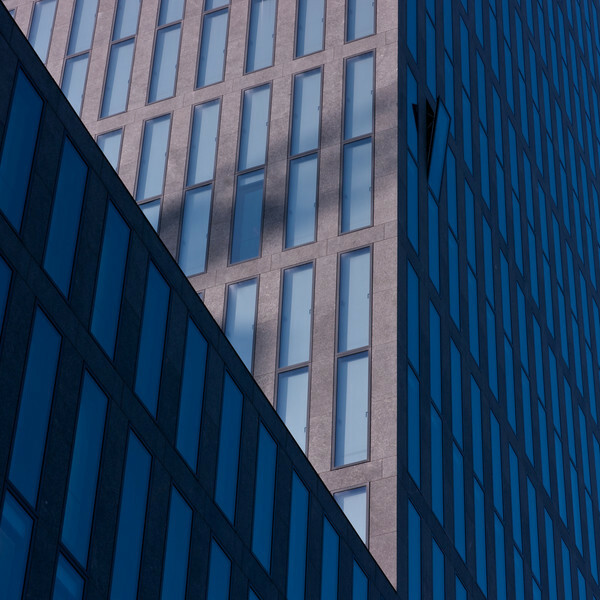 The color in the sunlit part is close to the geometric minimalistic urban pattern photograph, while the composition rather resembles the triangle leftovers photograph. The composition below is almost a negative version of last weeks triangle photo: it is the triangle in the background that is sunlit, while the facade in the foreground is shrouded in shadows. There is also no leftover here, but only a sunlit and a shady triangle. For the time being I have actually filed this photograph under the theme "outliers". For this topic I try to find and photograph regular and repeating patterns that are interrupted by a single element that breaks ranks and escapes the otherwise precise and regular arrangement. In this photograph, the outlier is not very prominent, but I think that once spotted it is drawing attention. Do you favour one of the three skyscrapers on Hagenholzstrasse over the others? Do you have photographs of outliers? Have a nice day and a good week! I have just shed a grain of my wide ignorance - I learnt from the radio (SWR1, which I like a lot) and several news articles that today, January 27, is the International Holocaust Remembrance Day. Many countries have their own holocaust memorial day, but January seems to be the most common. For example, the UK commemorates The Holocaust on this day since 2001, while the United Nations established January 27 as the International Holocaust Remembrance Day in November 2005. This year's remembrance day is dedicated to the children and I encourage you to read or watch the moving and excellently written message from Mr. Ban Ki-moon, the Secretary-General of United Nations. I particularly like the ending stating that children are particularly vulnerable and that we must show children the best the world has to offer. I also encourage you to visit the webpage of the Holocaust Museum in Washington D.C. and the Holocaust Memorial Day Trust encourages us all to speak out against discrimination, hatred and racism. The photograph above is a triptych of the Memorial to the Murdered Jews of Europe (also named Holocaust Memorial) in Berlin. I have only been once to the memorial on a cool, foggy early morning and I experienced it as an awe-inspiring locality with a mystical atmosphere. In the triptych above, I like the geometric patterns and clear shapes of the center photograph, and the bordering photographs - purposefully developed rather light or dark - try to convey my sense of the mood on that morning. I wish you all a nice, harmonious and loving weekend! Here is another photograph of the skyscrapers on Hagenholzstrasse in Zurich Oerlikon that were already the subject of last weeks post. This is again a simple, minimalistic, geometric composition of cityscape patterns, but yet this photograph is very different from the version of last week. The more I sort and order my cityscape photographs, the clearer I recognize recurring themes and elements. I should really reorganize my photographs! The photograph below would for example fit themes such as "urban patterns", "façades" or "triangles". I seem to have a weakness for triangles and "triangle leftovers". Many of my otherwise homogenous cityscape compositions contain a triangular piece of sky or background. I often take different versions of a subject, but in most cases I prefer compositions that include a small piece of background somewhere. In most cases, the triangle leftover is on either of the top corners, but in this case the triangular piece of sky is on the bottom left. In general, I like the interplay between the dominant triangular shapes and the repeating, geometric pattern in the photograph shown here. You can discern several repetitions of triangular shapes all over the photograph. Even though I have not realized when composing the photograph I very much appreciate the tiny arrow pointing into the lower right corner. It is only a small detail, but since I have discovered it, this "exit arrow" makes me smile. 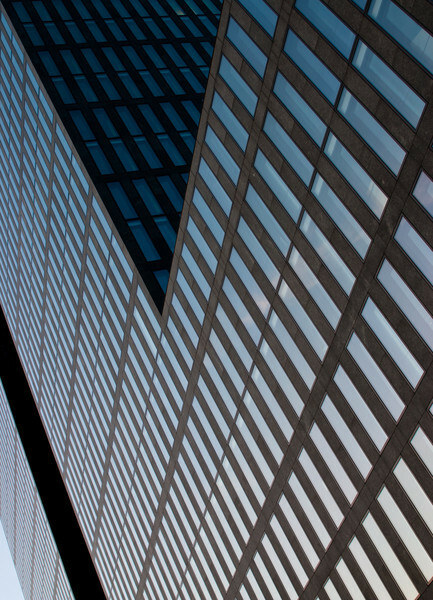 Here is a simple, minimalistic, geometric photograph of cityscape patterns. I like very much to search and photograph urban geometric patterns and pursue this interest regularly on walks and photo bike rides around where I live. The photograph below shows the skyscrapers on Hagenholzstrasse in Zurich Oerlikon. The buildings were once named sunrise towers, but they have traded ownership and now apparently bear the name of a swiss bank (to which I am even less inclined to link). The towers gained notoriety when the famous swiss flying man Ueli Gegenschatz died after a base jump from one of the buildings (I highly recommend watching his amazing TED talk). At the moment, two towers and additional buildings are rising up, which will all be part of a whole business center named Quadro. I like the colors and regular pattern of this photograph and to me it seems as if it was a floor pattern. However, it is of course the facade of one of the skyscrapers and you are enjoying a straight look up. 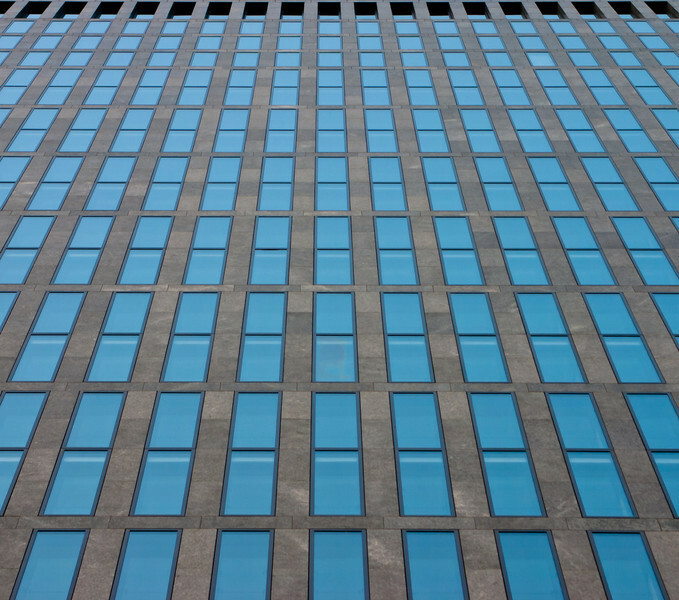 Depending on the weather and the time of the day the colors of the glass windows change color, but I like the combination of the blue windows and the grey stone in this photograph. When I recently wanted to prepare the above photograph for printing, I could not find it anymore and realized that I had deleted it unintentionally. This can of course happen very quickly. The photograph may have been still selected when I clicked on other photographs that I wanted to delete from within lightroom or I accidentally marked it as "rejected" (in my workflow, I regularly delete everything marked as "rejected"). Luckily, I also regularly backup our entire hard drive and the disappeared photograph could indeed be restored from a backup taken a couple of months ago. So I really encourage all of you to implement a regular and complete backup strategy. Simply mirroring content on two separate drives is not enough. Whatever you delete accidentally is gone on both discs. I hear of many people who have no backup strategy whatsoever and I cannot help but wonder how it is possible to be so naive. Even a thorough backup schedule is no guarantee that you will never loose data, but a few very simple steps can make your precious photographs and data a lot more secure. If you have no backup strategy, buy an external hard drive immediately and start backing up your data! The photograph shown here, which I luckily recovered, belongs to the light and shadow gallery and is a composition that I like very much. 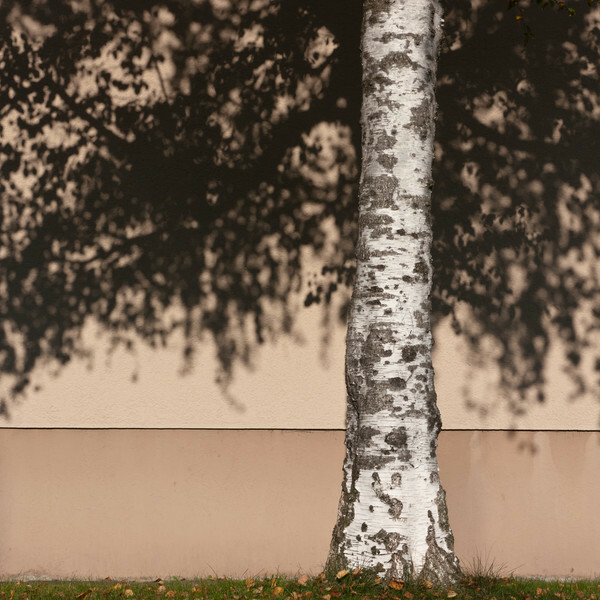 I came by this birch on a photo bike ride and was immediately captivated by the combination of the real black and white tree trunk with the shadowed foliage on the wall behind. This photograph is also an ethical riddle: In the above photograph, you will discern an "M" inscribed on the trunk, which is removed (at least partly) in the version below. I am still undecided if I find it justified to remove such "thorns in my side" or not. On one hand, I think that the content of photographs should not be manipulated. On the other hand, the writing on the trunk does slightly disturb me. The best solution is to keep my eyes open for a better composition with an untouched trunk. Do you have an opinion on removing "thorns" as in this photograph? I hope you enjoy, wish you a nice day and a good week. This is the time for setting resolutions, plans and goals for the new year. In particular with respect to blogging, most guides recommend setting clearly measurable "external goals" (such as number of visitors, subscribers, comments, earnings etc.) and similarly "economic" measures are of course applicable to any aspect of our lives. While I absolutely agree that it is important to make plans and to have goals, I am decidedly against setting defined economic or external goals for the things I do. My overall goal is to love what I am doing and to do what I love. I think it is a mistake to set external goals. External goals replace my own values with those of others. External goals let others decides whether I can be satisfied with what I do. Set goals that depend on your effort, creativity or dedication. Do not set goals that depend on the valuation of others. Set your happiness, consciousness and integrity as the highest goals. Metaphorically, many things in your life, even life itself, are like a school exam: You can study in order to get a certain mark or you can study in order to understand and learn. I never studied for marks but only for myself and because I wanted to understand. This does not mean that I did not want to do well, but doing well was not the primary motivation and it was me who defined "well". Before each important exam I had studied as much as I considered appropriate and necessary and I was decided to pursue other studies should my efforts not suffice to pass. I did not fail my exams, but I did of course reach turning points where I had to reconsider my path and change long-held plans. Nevertheless, I am glad that I never set external goals such as a mark, a salary, a title or a position as my goals. I consider not setting external goals a luxury. As every luxury object it does not come for free, but the travails buy you peace of mind and freedom. Please do not mistake the absence of external goals as a sign of low standards or an excuse. In many cases even the contrary might be true. All I do is to suggest defining goals that you can reach by yourself and which do not depend upon any sort of valuation of others. I try to follow this approach, I make many mistakes, I try to improve myself and to learn as much as I can from others; hoping that it brings peace of mind and happiness. I wish you wisdom in setting the goals that will help you become happy and satisfied in the new year 2012!